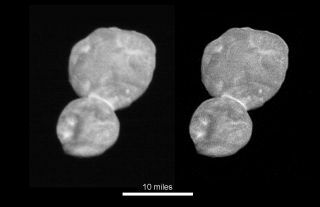 The Kuiper Belt object Ultima Thule, as seen by NASA's New Horizons spacecraft during its historic flyby on Jan. 1, 2019. These images, released Jan. 2, were taken from a distance of 18,000 miles (28,000 kilometers) with a scale of 730 feet (140 meters) per pixels. NASA hasn't been totally grounded by the government shutdown. The partial shutdown — which is the nation's longest ever, at 24 days and counting — has of course had a serious impact on the space agency. More than 95 percent of NASA employees have been furloughed, and development work on most future space missions has been slowed or suspended. Indeed, some NASA workers gathered outside the agency's Johnson Space Center in Houston today (Jan. 15) to protest the shutdown and its deleterious effects on their lives and the nation's space program. But some "excepted" employees remain at work, keeping NASA people and operational spacecraft safe. For example, life aboard the International Space Station (ISS) continues much as it did pre-shutdown, with astronauts conducting a range of scientific experiments and public-outreach work. Last week, NASA astronaut Anne McClain conducted an orbital Q&A with students from Kranz Junior High, a school in Dickinson, Texas, that's named after former NASA flight director Gene Kranz. McClain answered a variety of questions, from the nature of the research performed aboard the ISS to the type of training astronauts receive to whether your ears pop in space. And on Sunday night (Jan. 13), a SpaceX Dragon cargo capsule departed the orbiting lab for Earth, eventually splashing down in the Pacific Ocean. The robotic Dragon brought down important scientific research and hardware for examination here on terra firma. Then there are the active space missions. NASA probes continue to gather data in Earth orbit and at the moon, Mars, Jupiter and beyond. The OSIRIS-REx spacecraft slipped into orbit around the near-Earth asteroid Bennu during the shutdown, on Dec. 31. And a day later, the New Horizons probe pulled off the most-distant planetary flyby of all time, zooming past the small object Ultima Thule more than 4 billion miles (6.4 billion kilometers) from Earth. Space fans should all hope that the shutdown ends soon, so NASA can get fully back on track and thousands of workers can start getting their paychecks again. But don't think the agency is shuttered just because its website is much more fallow than before. You can learn more about NASA activities during a shutdown in this FAQ.